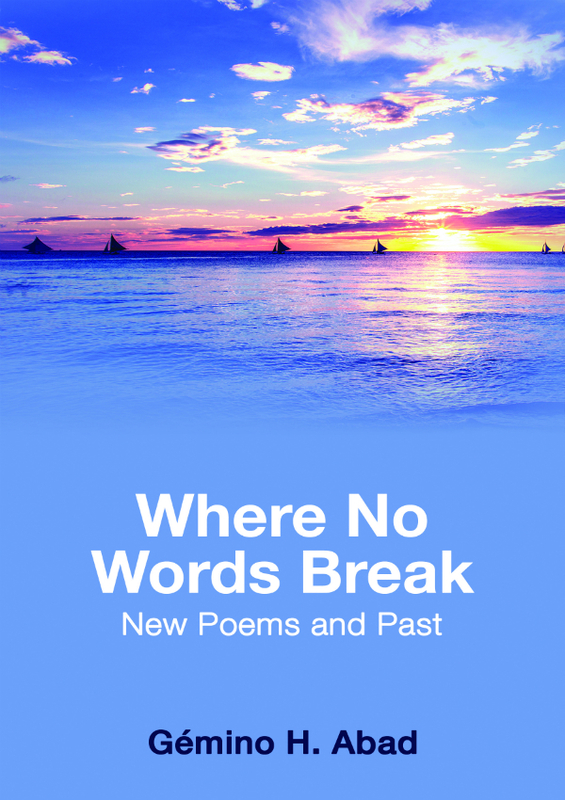 Where No Words Break consists mostly of new poems and spindrift verses since 1973. These play variations upon three interlocking themes: mind, language, poetry; self, love, family; and people, country, God. For any writer, no historical language, be that English or Filipino, is a given: rather, it is forged in that word’s triple sense: to form or shape, to mime or simulate, and to advance, to forge ahead. The ground of language is first only broken, as the Latin word versus (which signifies “furrows”) suggests. For the meanings of our words (whatever the language) do not arise so much from the differential play among them (where the words only read one another) as from lives lived as imagined through a people’s history and culture. Thus, the poet’s agon (struggle with his linguistic medium) is a contest for a prize: oneself speaking where no words break. And thus the poet makes his own clearing within the language he adopts—a native clearing where he finds himself and his own people. Gémino H. Abad, University Professor emeritus of literature and creative writing at the University of the Philippines, is a poet, fictionist, and literary critic and historian, with various honors and awards. In 2009, he received Italy’s Premio Feronia for his poetry translated into Italian by Gëzim Hajdari and Amoà Fatuiva. All Our Nameable Days (2013) is his ninth poetry collection, and Imagination’s Way: Essays Critical and Personal (2010), his eighth collection of critical essays; he has two collections of short stories, Orion’s Belt (1996) and A Makeshift Sun (2001). He is known also for his three-volume historical anthology of Filipino poetry in English from 1905 to the 1990s—Man of Earth (co-ed., Edna Zapanta Manlapaz, 1989), A Native Clearing (sole editor, 1993), and A Habit of Shores (sole editor, 1999); and a six-volume historical anthology of Filipino short stories in English from 1956 to 2008—Upon Our Own Ground (2008); Underground Spirit (2010); and Hoard of Thunder (2012). He obtained his PhD in English at the University of Chicago in 1970, and continues to teach at UP where he has served as Secretary of the University, Vice-President for Academic Affairs, and Director of the UP Creative Writing Center (now an Institute).